INDEPENDENCE DAY GREETINGS TO OUR VISITORS. 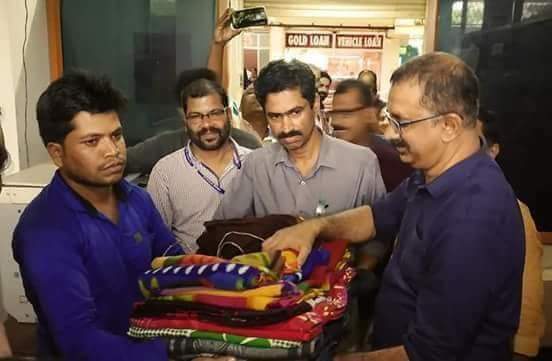 Vishnu Kachhava, is a young man from Madhya Pradesh.He was carrying blanket from Haryana to Kerala and selling it in Kerala villages.Then came the worst rain and floods. Seeing the people in relief camps shivering, Vishnu donated all the blankets he had! Really great. 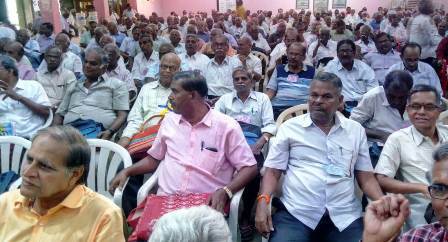 Tamilnadu circle conference was notified for 7 and 8 August 2018 at Tiruchirapalli. More than 700 Delegates arrived on the venue and the conference started at 10 AM on 7-8-2018. 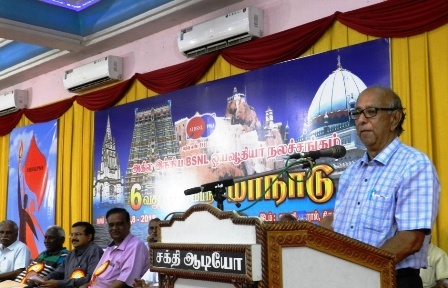 But, due to the official announcement of demise of Shri M Karunanidhi in the evening of 7-8-2018, the conference had be concluded within one day. 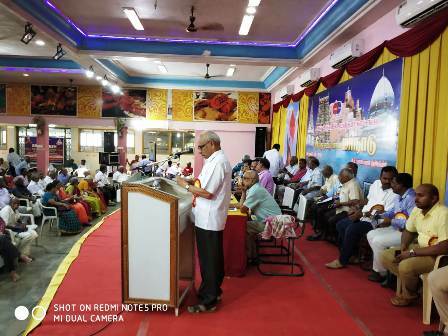 Comrades P S Ramankutty, D Gopalakrishnan, G Natarajan, T S VIttoban, K Muthiyalu, V Rama Rao and S Arunachalam represented the CHQ in the conference. 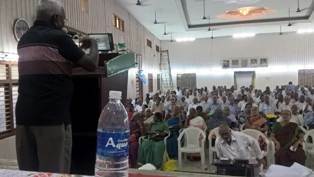 CGMT of Southern Telecom Project circle, CCA of Tamilnadu and many other officers also addressed the big event. Comrades PSR & DG addressing. Coms. Natarajan, Rama Rao, Vittoban, Muthiyalu, S Arunachalam etc. are in the picture. We join thousands of people of Tamilnadu and outside in paying respectful homage and rich tributes to Shri M Karunanidhi (popularly known as Kalaignar) who passed away at 6.10 on 7-8-2018 after battling with death for many days. Shri Karunanidhi strode the Tamilnadu politics like a colossus for more than 50 years and fought for social justice. In Politics, as usual with many of his contemporaries, there may be some controversy around him. 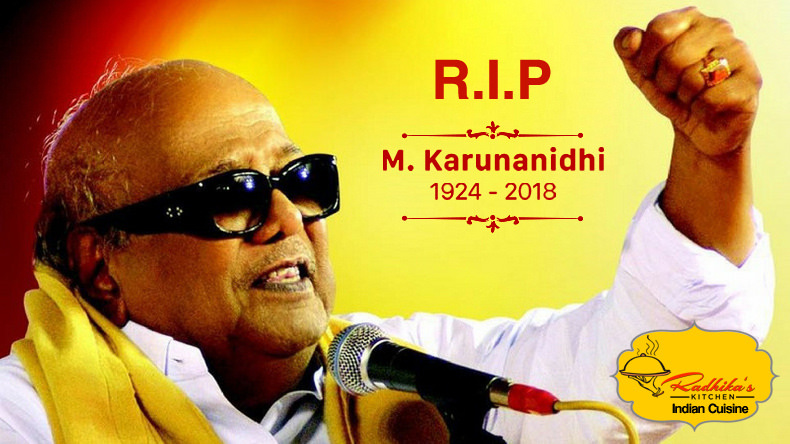 But Kalaignar will be remembered by future generations for his great contributions to the Tamil Literature, Social reform movement and Tamil film industry. 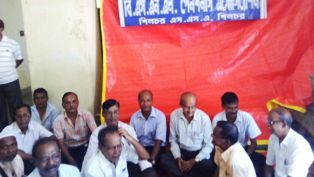 NEW CIRCLE UNIT IN KOLKATA TELEPPHONE DISTRICT. On 30-7-2018, two branches of AIBSNLPWA have been formed in Kolkata TD in the presence of GS. Two more branches will be formed very soon. An ad-hoc committee is also formed to hold Circle Conference within three months. 2015-2016: BSNL Loss Rs. 4859 Cr. MTNL: Loss Rs 2006 Cr. 2016-2017: BSNL Loss Rs. 4786 Cr. MTNL Loss Rs 2971 Cr. 2017-2018: BSNL Loss Rs. 4785 Cr. MTNL Loss Rs 2971 Cr. As on 31-7-2018, the total amount received by CHQ from branches towards Puri AIC fund is Rs. 14,87,850. Little short of Rs 15 Lakh. We have done it. Only our AIBSNLPWA can do it comrades. 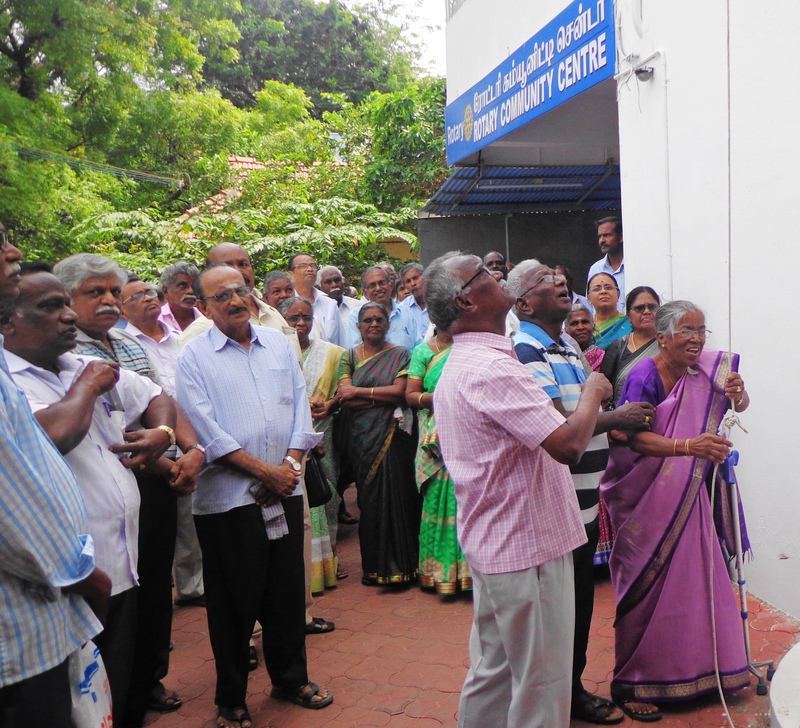 I understand some other branches have collected the donation from members but not yet remitted to CHQ. They may be waiting to do it at Puri. 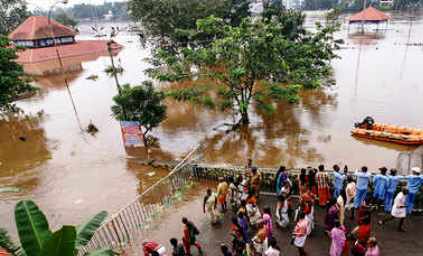 I hope that the total will reach Rs 17 lakh. All India Consumer Price Index has increased by 2 points from 289 in May to 291 in June 2018. So, the CDA will be 9% from July 2018. 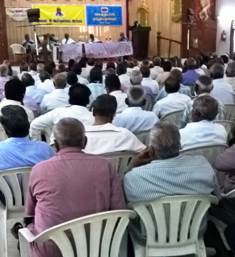 Nagercoil (Tamilnadu) District branch held its conference in the Rotary Club hall on 28-7-2018. Senior member Smt. 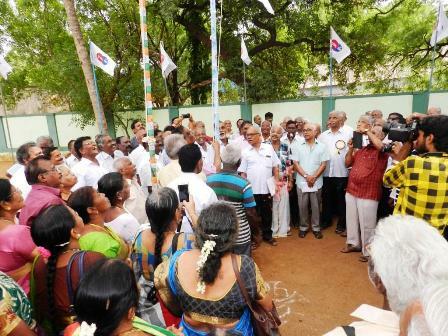 Dhannybai hoisted the Association flag at 10 AM. Com. 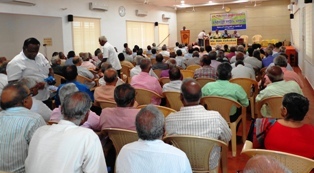 G Dhamodaran, presided over the meeting. Open Session was addressed by all India President Com. P S Ramankutty, Circle Secretary Com. 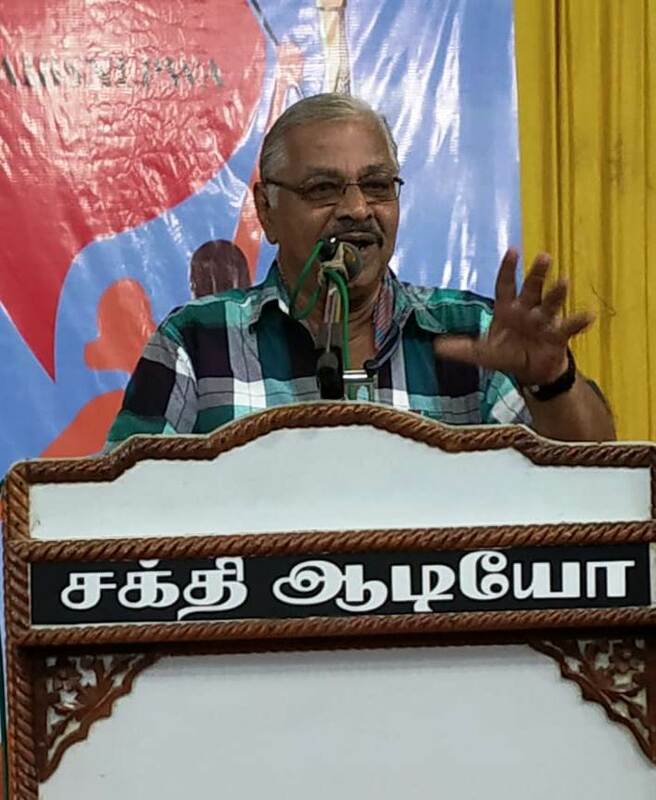 K Muthiyalu, Circle Org. Secretary Com. 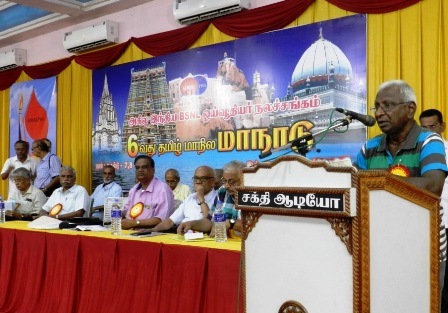 E Kanagaraj, CGPA leader Com. Subramanyam, District Secretary Com. A Chellaih etc. 178 members, including 17 ladies, attended the district conference. 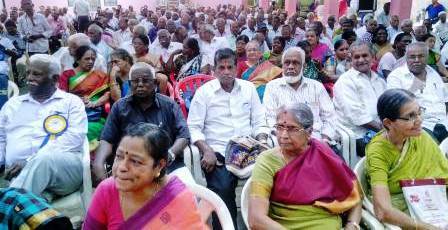 Salem West branch held is Annual GB meeting on 24-7-2018. 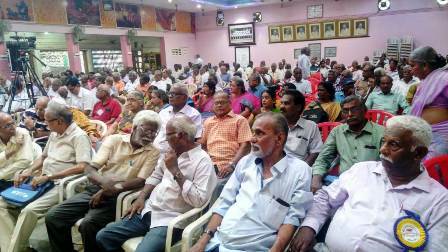 Comrades G Natarajan, K Muthiyalu, T S Vittoban, V Rama Rao etc. participated on behalf of CHQ. 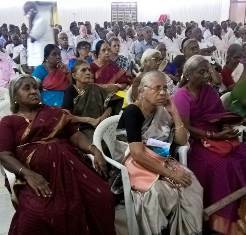 1.BSNL retirees are also covered by CCS (Pension ) rule 1972.Other central government pensioners governed by the said rule got pension revision; but it was denied to BSNL retirees. 2.II PRC report was implemented and pay was revised in the case of BSNL Executives in February 2009. Thereafter the benefit of II PRC were granted to Non executives in wage revision in May 2010. 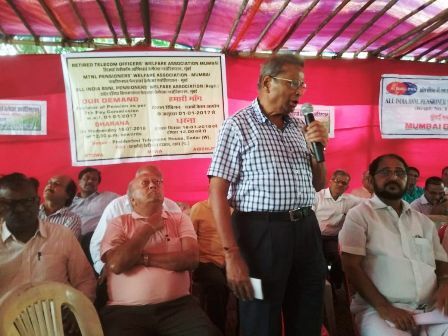 But the benefits were not extended to BSNL retirees then. (Means: Even if wage revision takes place pension revision is not automatic). So, do not link Pension Revision with Pay Revision. 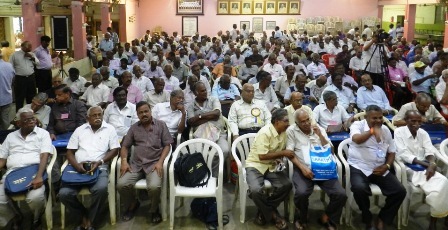 3.Denial of pension revision is denial of justice. The letter is attached here. Com. Dushsan Acharya, Retired JTO and an active member of our Cuttack branch expired on 23-7-2018. He was 72. 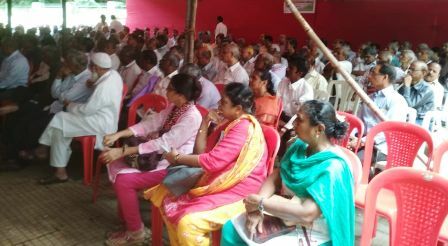 Large number of comrades attended his funeral and paid tributes. CHQ CONVEYS HEARTFELT CONDOLENCES. A new branch of AIBSNLPWA has been formed in Amroha SSA of UP West. Com. Kailash Gautam (CS) and Com. 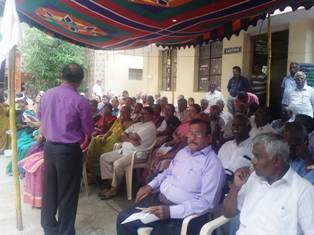 R C Sharma (ACS) attended the formation meeting. Comrades Om Prakash, Total Ram and Shiv Kumar are elected as DP, DS and Treasurer respectively. 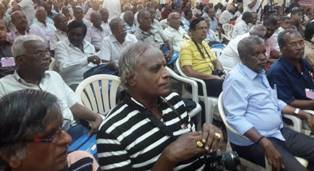 On 18-7-2018, under the banners of RTOWA, MPWA and AIBSNLPWA, more than 700 pensioners belonging to MTNL Mumbai and Mumbai Telecom Factory staged a mass dharna in front of Telephone House, Dadar demanding Pension Revision with CPC fitment formula for all retirees of MTNL and BSNL . 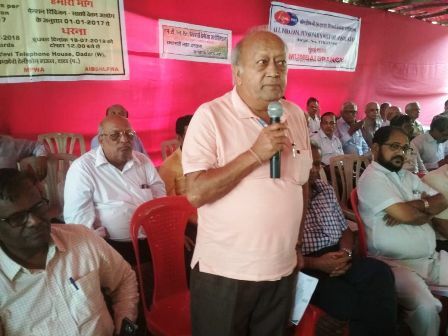 The participants were addressed by S/s M K Bagchi (veteran leader of Delhi MTNL workersand Pensioners), A K Kaushik, B R Pathak, J S Yadav, T S Prabhu of Mumbai TF, S M Ashirkar, Pawar, K Jawahar and S M Sawant. DELHI COMRADES HAVE DONE IT !!! MARVELLOUS !!! Com. Anupam Kaul, AGS of AIBSNLPWA and Com. 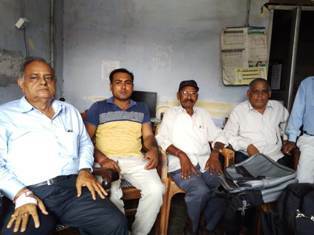 S S Nanda, Convener of United Forum of MTNL Retirees, along with two other office-bearers, went to the office of PM and the Minister of State for Personnel and submitted a memorandum . 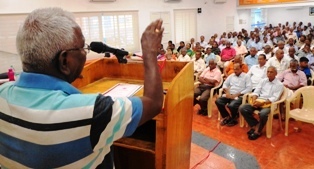 CHQ congratulate veteran leaders - Com. G L Jogi, Com. Sebastin, Com. 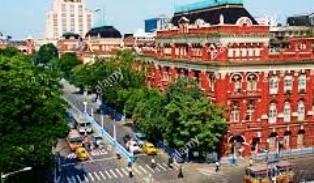 V K Tomar, Com. Sunil Kumar, Com. Mahavir Singh, Com. S S Nanda, Com. Anupam Kaul, Com. J S Dahiya, Com. Sher Singh, Com. Kailash Gautam, Com. J S Malik, Com. Arun Sharma, Com. Vipin Sharma and all others - for making the programme a historic one in Delhi. This is not the last programme. We have to do a lot. 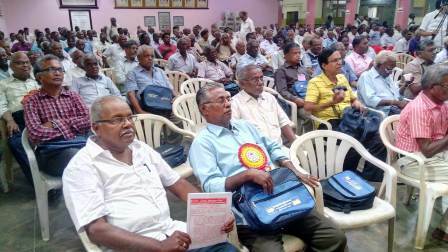 We are extremely thankful for extending the without voucher facility for Retired employees vide above order. We also thank you for raising the minimum to 12,000/ per year and for extending78.2% for calculation. But the Maximum of 23 days instead of 25 days and reducing the eligibility to 25%of 23 days is a very steep reduction. 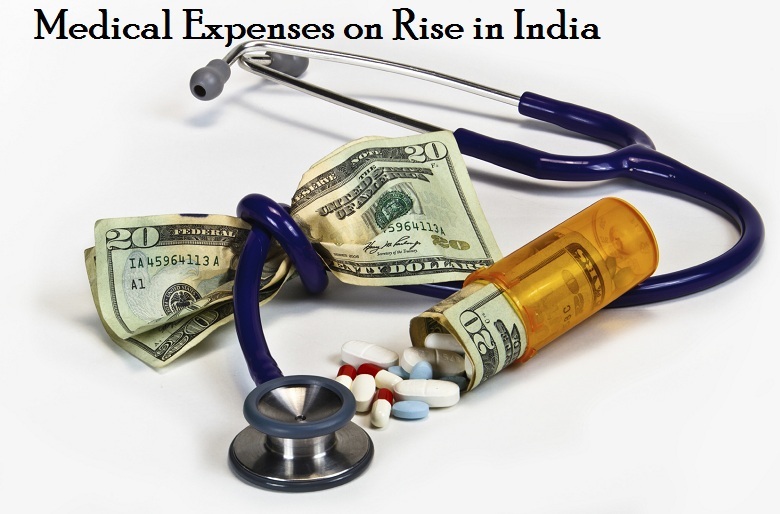 This affects the senior people as the need for medical is more for them with increasing cost of medicines. Hence it is requested to consider restoration of 50% of eligible amount and issue orders for the same.